(Nanowerk News) Objects in our daily lives, such as speakers, refrigerators, and even cars, are becoming "smarter" day by day as they connect to the internet and exchange data, creating the Internet of Things (IoT), a network among the objects themselves. Toward an IoT-based society, a miniaturized thermoelectric generator is anticipated to charge these objects, especially for those that are portable and wearable. Due to advantages such as its relatively low thermal conductance but high electric conductance, silicon nanowires have emerged as a promising thermoelectric material. Silicon-based thermoelectric generators conventionally employed long, silicon nanowires of about 10-100 nanometers, which were suspended on a cavity to cutoff the bypass of the heat current and secure the temperature difference across the silicon nanowires. However, the cavity structure weakened the mechanical strength of the devices and increased the fabrication cost. 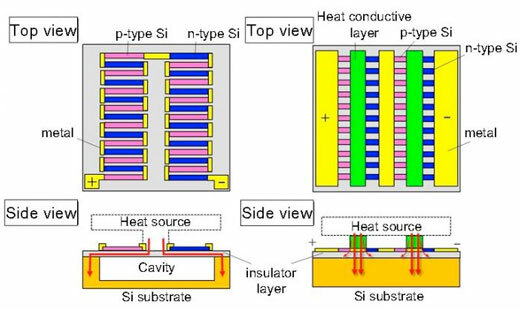 To address these problems, a team of Japanese researchers from Waseda University, Osaka University, and Shizuoka University designed and successfully developed a novel silicon-nanowire thermoelectric generator, which experimentally demonstrated a high power density of 12 microwatts per 1 cm2, enough to drive sensors or realize intermittent wireless communication, at a small thermal difference of only 5°C ("10µW/cm2-Class High Power Density Silicon Thermoelectric Energy Harvester Compatible with CMOS-VLSI Technology"). "Because our generator uses the same technology to manufacture semiconductor integrated circuits, its processing cost could be largely cut through mass production," says Professor Takanobu Watanabe of Waseda University, the leading researcher of this study. "Also, it could open up a pathway to various, autonomously-driven IoT devices utilizing environmental and body heats. For instance, it may be possible to charge your smartwatch during your morning jog someday." The newly developed thermoelectric generator lost the cavity structure but instead shortened the silicon nanowires to 0.25 nanometers, since simulations showed that the thermoelectric performance improved by minimizing the device. Professor Watanabe explains that despite its new structure, the new thermoelectric generator demonstrated the same power density as the conventional devices. More surprisingly, thermal resistance was suppressed, and the power density multiplied by ten times by thinning the generator's silicon substrate from the conventional 750 nanometers to 50 nanometers with backside grinding. Though the research team will need to improve the quality of the generator for stationary power generation in various conditions, Professor Watanabe hopes that the results achieved in this study will serve to support power technology in the IoT-based society.